Welcome to HKU and welcome to the Common Core! Required of all HKU undergraduates, the Common Core encourages you to explore, experiment, jostle with the unfamiliar, and to make a positive difference in the world around you. Why bother with this type of interdisciplinary and interactive learning beyond your major? You (or your parents!) might be asking yourselves this very question. First, as every employer hopes for, the Common Core addresses the demands of the 21st century workforce for more refined capacities in communication, critical thinking, collaboration, and creativity. Secondly, the Core enables you to practice cross-disciplinary knowledge that expands connections instead of narrowing them to ever greater degrees of specialization. This will be a useful talent both at the university and beyond. And, finally, the Core provides you with an opportunity to deepen your informed ethical responsiveness to the profound challenges we are all facing. Bring all you can, to this experience: your intensity, your desire to know and to do, your anxieties, your questions, and your dreams. You will, I promise you, make new friends across all the Faculties and discover things you haven’t even imagined. 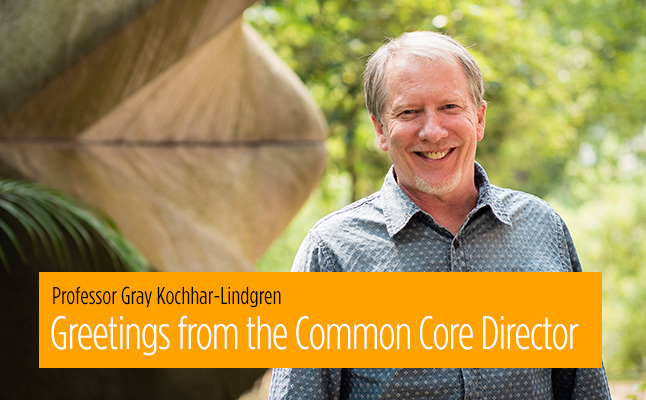 Be in touch with us and remember to create the Common Core that YOU want!